Equestrian helmets are an essential part of horse riding, whether you are under tuition, eventing, racing or just cantering across open fields. The range of accessories to brighten up and personalise headwear enables young people to create their own fashion statement, too. A well-fitted helmet can provide essential protection in the event of a fall. Wearing good quality riding clothing will help to cushion a fall and a high performance helmet is the most critical if your head meets a hard surface. Horse riding helmet typically have layers of air bubbles that help lessen an impact and keep the brain from rebounding inside the skull. When you choose your helmet, safety and comfort are key factors. Although price is an issue, a few extra pounds is a price worth paying for higher protection. Obviously, the risk when trotting around a menage on a small pony is less than the risk when galloping or jumping. 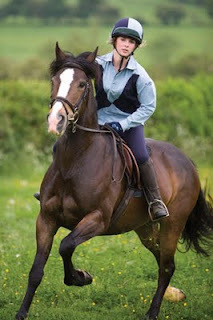 Ensure that you purchase a helmet that is specifically designed for horse riding. Unless you are familiar with helmet brands and sizes, be sure to try the helmet before buying. An experienced, trained salesperson at a specialist suppliers will be able to advise. When trying the helmet, it should easily settle to the top of your head and cover the entire skull and back of your head with the front about 3.5 cms (1.5 ins) above your eyebrows. The helmet should not move or swivel if you shake or nod your head. When the helmet strap is properly fastened, ensure that you can move your jaw and use your mouth as normal. If needed, special padding is available to line a slightly larger helmet for comfort. Remember that a helmet must fit properly to protect your brain from damage. One final tip: a helmet that has been impacted in a fall should not be used again and should be replaced. For this reason, do not buy a second hand horse riding helmet unless you are 100% certain that it has never been involved in a fall.